The absence of a central, public cemetery in Kailua today, unlike Kāneʻohe, should not suggest that our ahupuaʻa was devoid of human burials. Many remains—both pre-contact and later—have been found widely throughout our community by natural exposure and construction disturbance. In fact, iwi continue to be exposed in the center of town as the Target property, the adjacent housing complex, and the former Arby’s site have witnessed probes beneath the soil. Archaeological monitoring has been required by the state, anticipating that human remains would be uncovered. How should such “discoveries” be handled? Where should re-interment be made? What protocol should be used? Who should preside over these transfers? What patterns of ancient burials are suggested? Further, where were/are family cemeteries located within Kailua? Have others been bulldozed away during road and building construction? Present to discuss such questions will be Nanette Napoleon, June Cleghorn, family representatives, caretakers, and current Iwi Council members. In the context of the formulation of the Master Plan for Kawainui Marsh, it seems especially appropriate that consideration be given for a final resting place for Kailua’s ancestors. The program is open to the public. Here is an overview of our public meetings in 2012-2013. We have one more meeting this year – information and details will be coming soon! February 2012 Descending Stories: How shall we tell them? with Kaui Hart Hemmings, Tom Coffman and Maile Meyer. May 2012 Hula in Kailua with family and graduates of Bella Richards, Lani Kalama, Puluelo Park and the Beamer ʻohana. July 2012 Kailua: How Shall We Paint It with Sherree KcKellar, Carter Black and the Windward Artists Guild. October 2012 Before the Military: Mōkapu Peninsula with archaeology and former resident panelists. November 2011 Historic Harmonies: Kailua’s musical legacy with Charlani Kalama, Mihana Souza and Mrs. Shigeru Hotoke. January 2013 Going with the Flow: Roadside Stands with panelists Lydia Asato Ranger, Norman Kawauchi and Leroy Gilliland featuring the photographs from the Nishikawa-Kimura family. Welcome to the Kailua Historical Society website. We are a small nonprofit dedicated to collecting, sharing, and preserving the history of Kailua, located on the windward side of Oahu in the Hawaiian Islands. Please use the links to the right or at top to explore our site. Add your support to our activities. 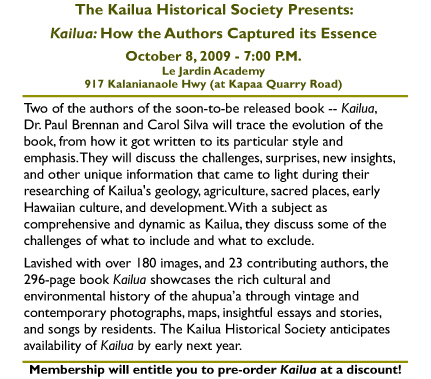 Explore our publications, including THE book about Kailua. Contact us if we can assist you or if you have Kailua stories to share with us. The Making of Kailua: Preserving the Kawai’nui Marsh – a conversation with Muriel Seto, a community leader who led the preservation effort. Muriel Seto returns briefly to Kailua and will trace her life-long love affair with the Kawai’nui Marsh and the many challenges – dating back to the 60s – faced in preserving it. Muriel, who was along-time member of the Lani-Kailua Outdoor Circle, will describe the strategies and events that took place due to her efforts and those who she worked closely with. In establishing the Kawai’nui Heritage Foundation, Muriel and her colleagues were successful in advocating for the preservation of the marsh and laid the groundwork for the preservation and restoration of this significant community feature of Kailua’s landscape – one that continues to have historical, agricultural, environmental, and cultural significance today. The extraordinary book KAILUA is now available! See what’s being said about our book Kailua. 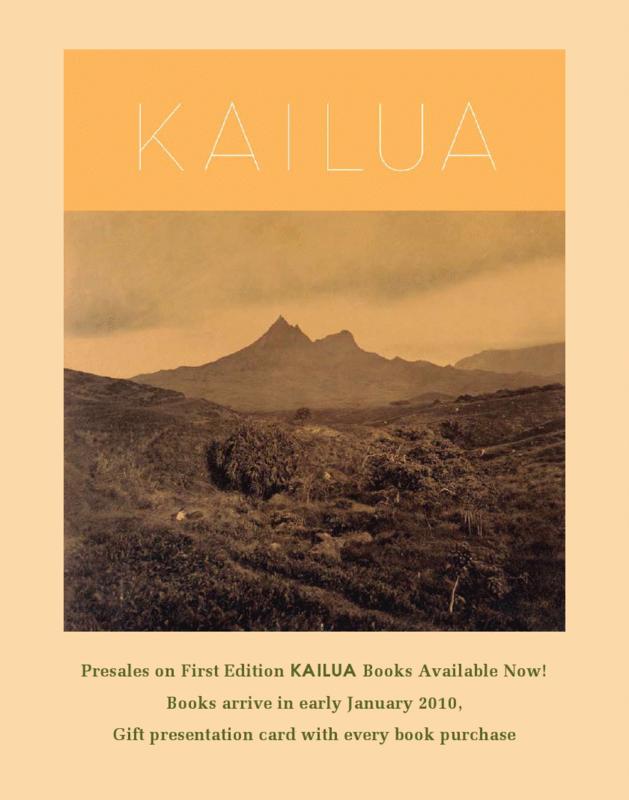 Kailua showcases the rich cultural and environmental history of the ahupua’a through vintage and contemporary photographs, maps, insightful essays and stories, and songs written by residents, past and present. The book has been in the making for several years. It is nearly 300 pages, includes over 180 photographs, and features the perspective of 23 authors and contributors on topics such as early land ownership, culture, agriculture, archaeology, geology, and environment. Your Kailua Historical Society membership will entitle you to purchase this book at a 15% discount. Membership and book purchase information is available on this website.